Is your front door a welcome mat for burglars? Even an entry door that looks quite secure might actually be vulnerable. If you take a look at home break-in statistics, you will see why it is so important front door security is. There are several approaches you can take to fix the common issues many homeowners have with front door security. You should be focusing on more than one way to protect your front door, you should be layering your security. 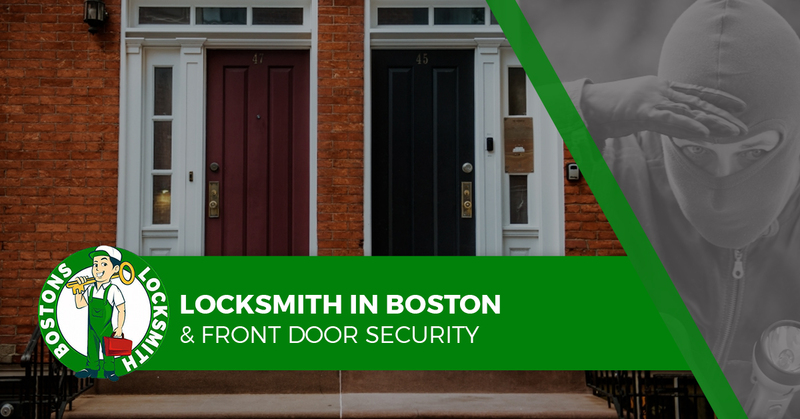 Bostons Locksmith, your locksmith in Boston, offers what you need to know about front door security. If your front door does not have a deadbolt lock, get one right away. Make sure the deadbolt lock fully extends into the door-jamb opening and is reinforced with a metal strike plate. You should also make sure that there are no screws exposed. You also might want to consider an exit-only deadbolt that does not have an exterior keyhole and can only be locked and unlocked from the inside. Solid-core doors are the most secure doors you can have, they are very difficult to kick or otherwise break in. To determine what type of door you currently have, knock on it and listen. If you hear an echo, you have a hollow door and you should swap it out with a solid door made of wood, fiberglass or metal. The most fundamental part of front door security is the locks. Locks determine the level of security offered for your home. You need to be aware that your lock is vulnerable and that there may be a better option. A thief is a lot less likely to target your home if it is well-lit. So it makes perfect sense to have bright outdoor lighting installed to deter illegal activities. A thief is a lot less likely to attempt to break into your home if they think there is a chance they will get discovered before they have gained entry. One of the best ways you can increase security is by eliminating obstructions in your front entryway. That is, get rid of the things that can shield a thief from view. Obstructions can be fences, trees and shrubs that thieves can hide behind. Other obstructions include porch furniture, large planters and lattice. Another great way to improve front door security is to keep it under surveillance. There are two main ways in which you can monitor your front door, with a security system or the use of cameras. One way you can improve front door security is with a smart doorbell. You might want to also consider WiFi-enabled smart locks. These allow you to keep an eye on your property from wherever you happen to be. Whether you are at the office or on a beach enjoying some downtime, your smartphone can be used to help protect your home. To learn more about front door security, contact Bostons Locksmith.